Whatever your type of sailing, from medium sized to very large yachts, D4® Premium membranes are for you. Whether it’s racing across the top of the Southern Ocean or cruising the world, club or Grand Prix racing, or anything in between, D4® Premium has the fibre and surface component combination perfect for all. D4® Premium allows yacht owners to select from the widest range of surfaces and fibres on the market. High modulus and high tenacity yarns can be applied as a single fibre type or in blended ratios with other fibres and combined with various film or taffeta surfaces. Industry leading flexibility in fibre placement and density guarantee’s that the sailmaker can provide the correct performance characteristics of the membrane. 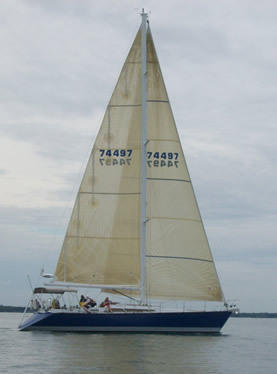 This flexibility allows the sailor to design a sail to their sailing activity, whether racing, cruising or both. 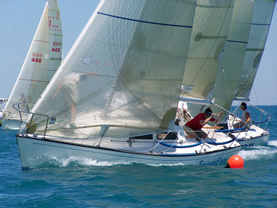 DIMENSION-POLYANT’s long standing experience in sailcloth design, fibre handling and laminating adds tremendous know-how and patented production methods to the successful D4® system, resulting in the most versatile and reliable membrane system in the world. Victories in multiple Grand Prix races, both around-the-buoys and offshore, offer proof of D4®’s superior performance. Durable – superior construction technology supported by over twenty yearsof laminating experience. Versatile – combinations of fibres, films and taffetas to meet your requirements whether racing or cruising. Light weight – industry leading lamination technology utilising both external positive pressure and vacuum system is the key to light membranes. 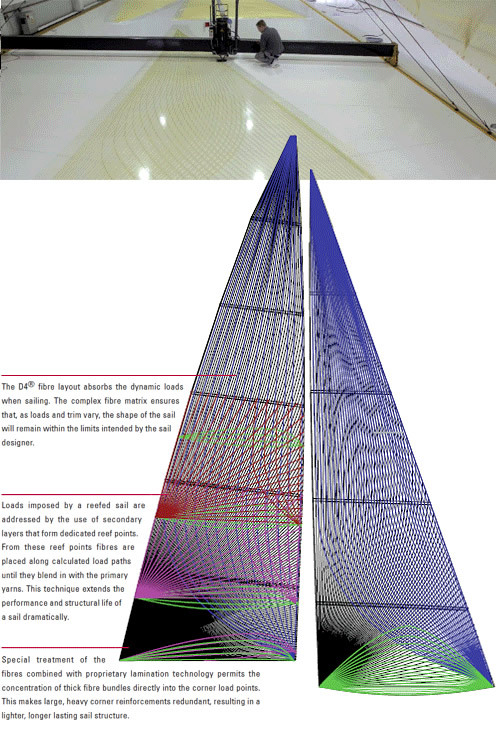 Shape retention – the complex fibre matrix ensures that, as loads and trim vary, the shape of the sail will remain within the limits intended by the sail designer. The D4® Multi Panel™ product line is DIMENSION-POLYANT’s most recent addition within the D4® family of membranes for yacht sails. D4® Multi Panel™ membranes are most suitable for boats up to 40 feet. D4® Multi Panel™ is designed to manufacture membranes in a speedy, highly automated manner employing advanced lamination and custom yarn trajectories. Multi Panel™ employs laid high modulus fibers which are load-path oriented and laminated between two layers of film. Taffeta and Internal Taffeta versions are available as well. The D4® Multi Panel™ line offers a more precise draft profiling for the membrane owing to the multiple seams of the Multi Panel™ configuration. This feature is most useful in sails used on boats under 40 feet, where more shaping is required. DP’s patented roll good lamination, as applied in the production of the custom layout of a Multi Panel™, provides a quality superior to most membranes found in the market place at such a price level. The resulting performance and durability is reflected by winning results from world championship competitors to club racing sailors looking for the ultimate in weight to stretch ratio. With this new product offered within the D4® family, sailors around the world can now choose from the most comprehensive membrane range to find the correct sail solution for every yacht. Although D4®Multi Panel™ is visually different from D4® Premium and D4® Fastline in panel size and yarn distribution, the performance elements of the sail membrane is maintained.